Your family will enjoy a unique way of life when you choose to live among the amenities and oceanfront views found at the North Myrtle Beach resort of Carolina Reef. 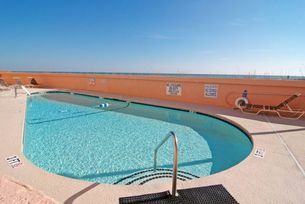 The North Myrtle Beach vacation rentals at this North Myrtle Beach resort make outdoor living easy because each of the rental units has an oceanfront balcony and there is an oceanfront pool deck at Carolina Reef. Furthermore the beach access could not be more convenient. Carolina Reef is a delightful destination for your family vacation or your romantic rendezvous. Not too small and not too large, this North Myrtle Beach resort is just the right size. And it is on the white sandy beaches which make it even more appealing to everyone. All of the North Myrtle Beach condominiums at Carolina Reef have direct oceanfront views from the living room, master bedroom and oceanfront balcony. Enjoy the sunny yellows and the blue of the sky and sea from throughout several rooms of your North Myrtle Beach condominium rental at Carolina Reef. At Carolina Reef you may enjoy a North Myrtle Beach vacation of leisure. From the time the sun comes up until it sets again in the North Myrtle Beach sky, your North Myrtle Beach vacation may be filled with relaxation and comfort. Choose one of these condos in North Myrtle Beach, SC and you will be glad you did. These North Myrtle Beach rentals come in two sizes. There are two-bedroom North Myrtle Beach vacation rentals with two baths and there are one-bedroom condos in North Myrtle Beach, SC with one bath. Carolina Reef is a North Myrtle Beach resort that has accommodations for two, four and six people. Pick the one that works best for your group and vacation needs and rest assured that all of these North Myrtle Beach condos will afford you a beautiful balcony overlooking the Atlantic Ocean. It is from the private balcony of your North Myrtle Beach condominium that you may keenly appreciate the simple joys of North Myrtle Beach life. Watch an oceanfront sunrise first thing in the morning. The coffee tastes better when it is enjoyed on an oceanfront balcony at sunrise. Look through binoculars at the birds soaring overhead and watch the pelicans nose dive into the Atlantic Ocean in hopes of retrieving a fish dinner. From your private balcony you can just let the tides tell the time. Inside these condos in North Myrtle Beach, SC is a world of modern conveniences and comfortable accommodations. There is a kitchen in each one of these North Myrtle Beach rentals. Some of these North Myrtle Beach vacation condominiums have a dishwasher in the kitchen which will likely prove to be most helpful during your North Myrtle Beach vacation. Most of the North Myrtle Beach vacation rentals at Carolina Reef also have a DVD player for your use. Take advantage of the microwave for some late night popcorn while you watch your favorite movie during your North Myrtle beach vacation. Sometimes just relaxing in the comfort of your private North Myrtle Beach vacation rental is a great way to spend one evening of your beach vacation. Downstairs at Carolina Reef is an oceanfront pool deck. Slip into the swimming pool that sparkles in the sunshine when the temperatures rise. Enjoy the hot tub when your body aches, such as after shopping all of the nearby outlet stores or playing 18 holes on a challenging Myrtle Beach golf course. Kids will love that Carolina Reef has a kiddie pool just for them. The shallow water is nice and warm and safe for toddlers to play in during your North Myrtle Beach vacation. Carolina Reef is a North Myrtle Beach resort that is in close proximity to all the amusements and attractions. Oftentimes the best part of a beach vacation is the food and North Myrtle Beach, SC will not let you down in that department. There are more than 1,500 restaurants around town and a large portion of them serve seafood. Go to dinner at a wonderful restaurant and then catch a show at one of the area’s live entertainment theatres. The Alabama Theatre and Carolina Opry are always good choices for live productions while Pirates Voyage and Medieval Times are dinner theatres you might consider. Myrtle Beach golf courses number more than 100 so making a tee time is quite easy during your North Myrtle Beach vacation. Shopping in North Myrtle Beach includes outlet malls, Barefoot Landing and Broadway at the Beach. Go visit The Market Common and shop the Orvis store or at the mall near the outlet center you will find Bass Pro Shop. Antique stores and consignment shops offer special, one-of-a-kind souvenirs and the beachwear stores that anchor most corners around town have all the beach chairs, totes, bathing suits and accessories you might want during your North Myrtle Beach vacation. Elliott Beach Rentals is not affiliated with onsite management or the HOA of Carolina Reef.